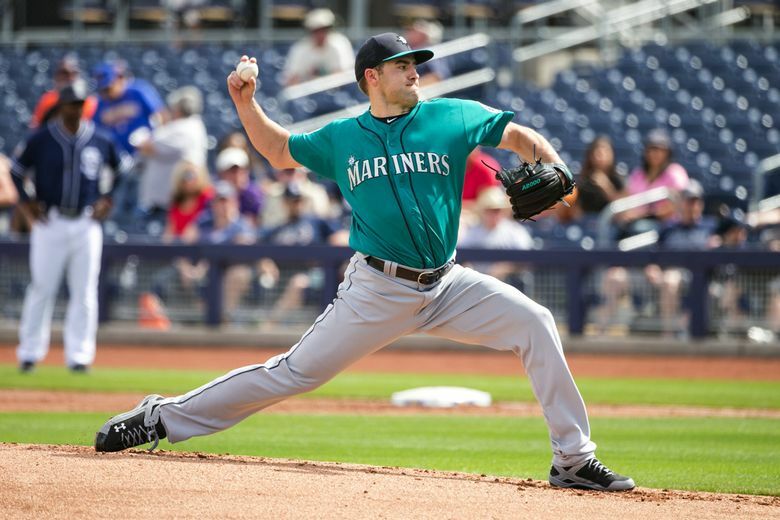 The Mariners on Monday optioned three players down to Class AAA Tacoma, including pitcher James Paxton, which means Nathan Karns has won the final spot in the team's starting rotation. PEORIA, Ariz. — The Mariners moved closer to finalizing their 25-man roster Monday, optioning three players to Class AAA, including starting pitcher James Paxton. That decision ends the competition for the No. 5 spot in the starting rotation, with Nathan Karns winning the job. Also sent down were outfielder/first baseman Stefen Romero, who was competing with Dae-Ho Lee as a right-handed first baseman as well as a backup outfielder, and shortstop Chris Taylor. That means Luis Sardinas will be the utility infielder. Though none of the moves was a surprise, some had thought the decision on the fifth starter might wait until after Karns pitches Monday against the Kansas City Royals. But manager Scott Servais said the team didn’t see a reason to wait, particularly in light of a tough start for Paxton on Sunday against the Cubs. He allowed seven runs and nine hits in four innings. That left him with a 10.80 ERA, six strikeouts and eight walks this spring. Paxton is 12-8 with a 3.16 ERA in 30 career starts for the Mariners and has been a regular member of the starting rotation the past two years when healthy. But he has been limited to 26 total starts past two season because of injuries. His health was not an issue this spring. Servais said the goal is for Paxton to go to Tacoma and stay ready. “We all know James Paxton is going to be a big part of our team at some point this season,’’ Servais said. “He has a track record of having very good outings at the big-league level, and we are going to need him, so let’s get him going and get him in a good spot mentally. Servais said Paxton had issues controlling the strike zone, noting his walks and strikeouts. He also allowed five home runs this spring, including three Sunday against the Cubs. “He just didn’t execute the way he wanted to,’’ Servais said. The right-handed Karns hasn’t been much better than Paxton, giving up 12 earned runs in 16 innings this spring after being acquired in a trade with Tampa Bay. He started 26 games last season for the Rays. The fifth spot will be critical early. Despite three off days in the first 15 days of the season, the Mariners will stay in their rotation, Servais said. That means Taijuan Walker will start the home opener April 8 against Oakland, with Karns going the next night against the A’s and then back to ace Felix Hernandez. Romero hit .357 in the spring but was hindered by having a minor-league option. It gave the Mariners roster flexibility to keep Lee. The team decided over the weekend to place Lee on the 40-man roster and almost certainly will put him on the 25-man opening-day roster as a platoon first baseman with lefty Adam Lind. Servais said Romero will play first base and outfield in Tacoma. Taylor, competing with Sardinas for the utility infielder’s job, hit .190 and had four errors, including one on a potential double-play ball in the ninth inning Sunday while playing second base that led to a run. Servais said Taylor will start at shortstop at Tacoma but also will play second, third and some outfield. Shawn O’Malley, sent down Sunday, also will play some shortstop and utility infield and outfield with the Rainiers. “Chris had as tough a camp as you could have,’’ Servais said. “I think he put a lot of pressure on himself early, and then he just tried to relax and go play, and that didn’t work out so good, either. So it happens, it happens to players. The moves leave the Mariners with 33 players in their major-league camp. Teams must be at 25 for the regular season, which for Seattle starts April 4 at Texas.